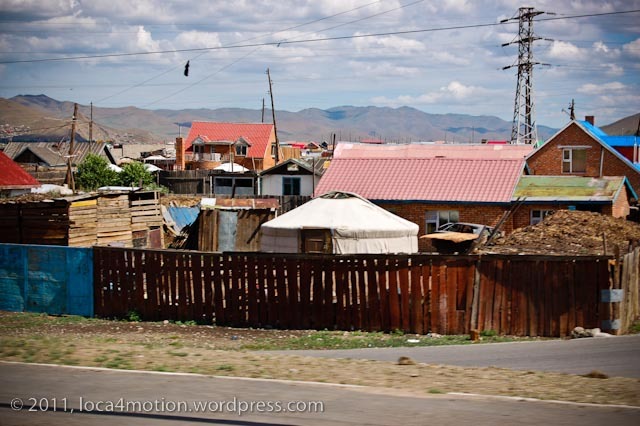 Suburbia in Mongolia’s capital Ulaanbaatar is like no other. 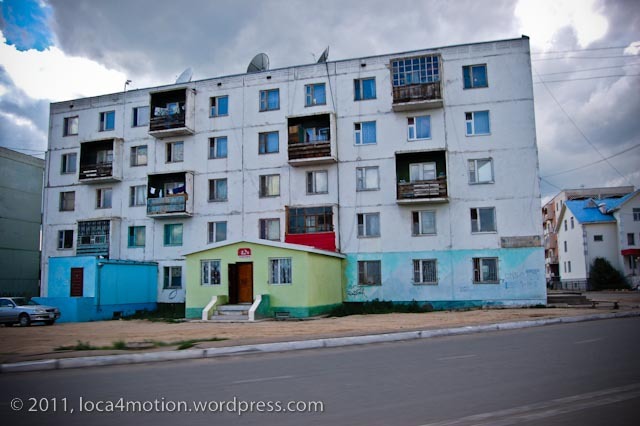 Bleak Russian-style apartment blocks give way to a patchwork of modern, red brick, matchbox-like houses. 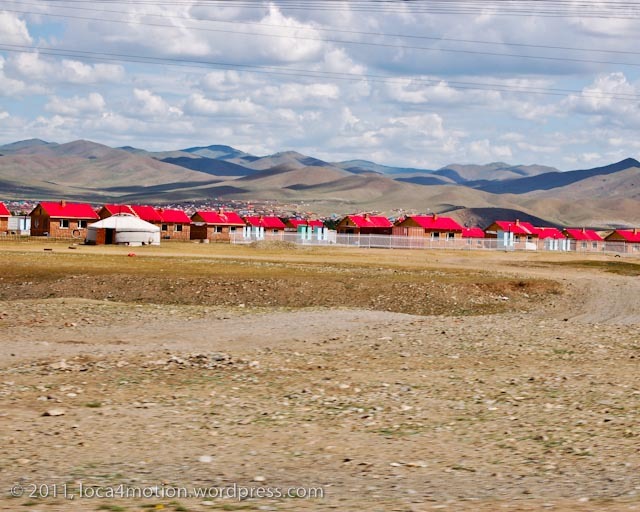 Tidy lines of vivid crimson, azure and jade roofs contrast starkly against the chalky curves of Mongolian traditional gers. 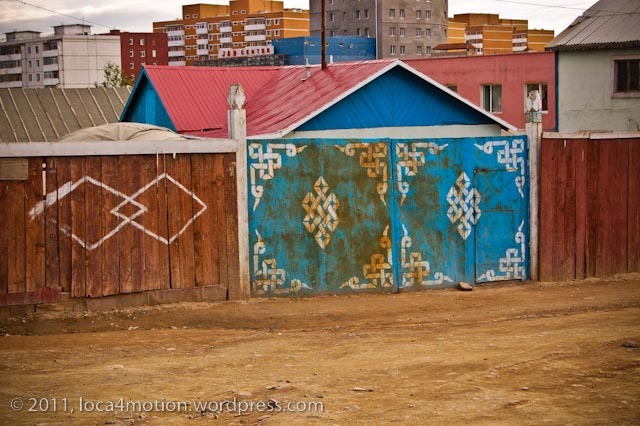 Intermingling, they compete for space tucked away behind wooden and rusty tin fences splashed with painted symbols. 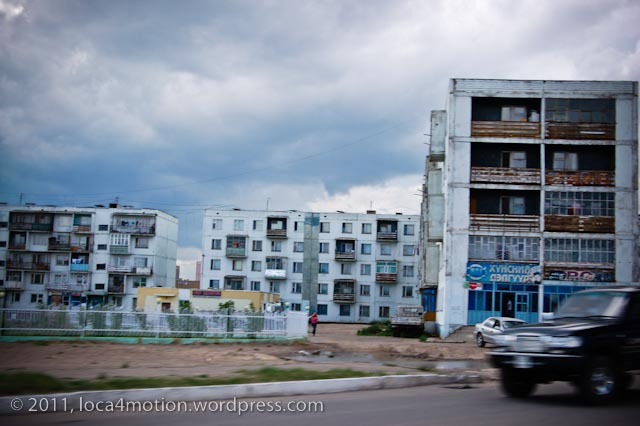 Driving out of the city, I captured a few images from the window of our moving van. 3. Not sure who this graffiti was aimed at. Hopefully not photographers! 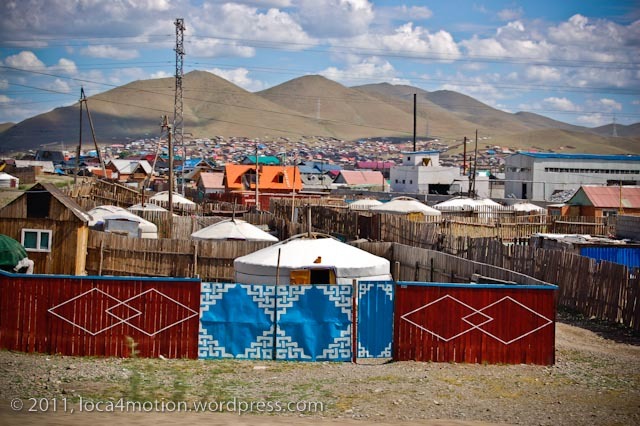 My other Mongolia posts include my brother’s Mongolian wedding, Nadaam festival and Mongolian contortionists. 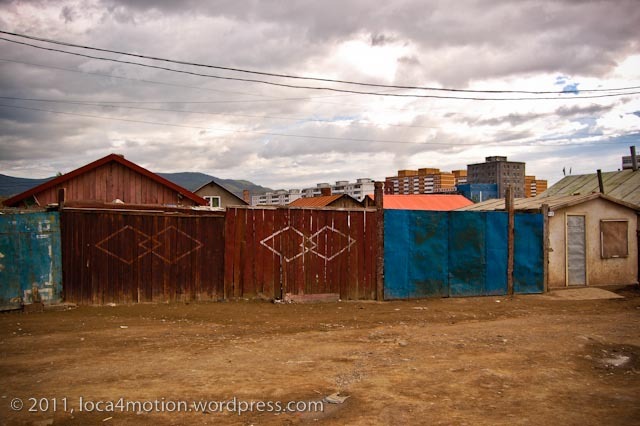 This entry was posted on August 2, 2011 by loca4motion. 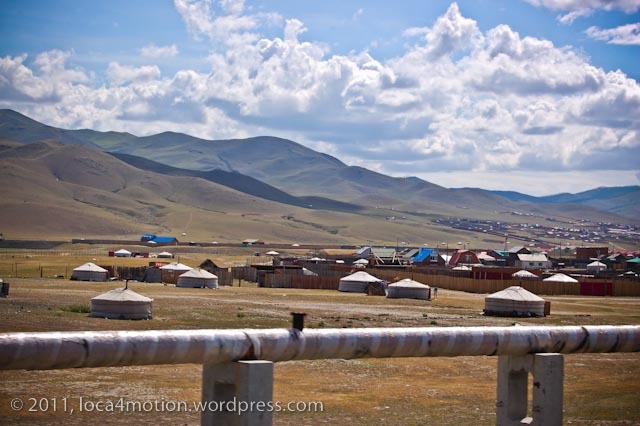 It was filed under Asia, Mongolia and was tagged with ger, mongolia, mongolian, photography, travel, ulaanbaatar, ulan bator, yurt. That’s some graffiti, I think I would have been too scared to snap the pic. I know! I just remembered that I was walking past this one (not driving) with my brother, his Mongolian wife, my other brother and some friends and no one seemed worried! We clicked a lot but there were no booms, thankfully. Wow, this looks crazy. 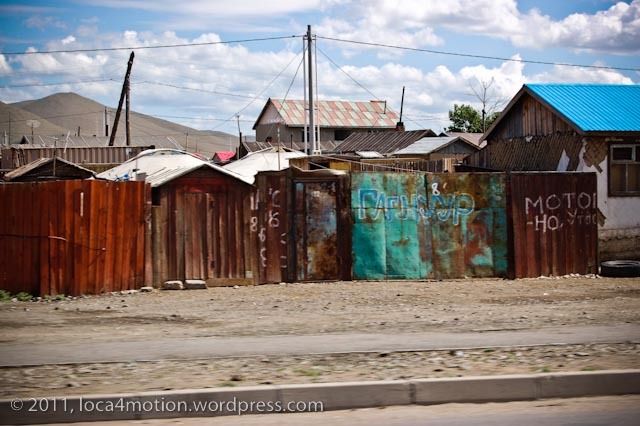 What was Mongolia like? When did you go and what did you do? 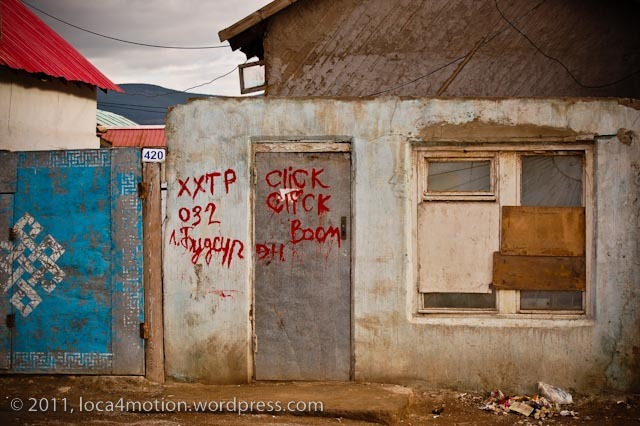 I someday want to visit this faroff place. Great pictures! Thanks thirdeyemom, Mongolia was incredible! I went last year for my brother’s wedding and only now am getting round to posting my non-wedding photos! There’s been too much going on in Guatemala and I’ve been posting on that. 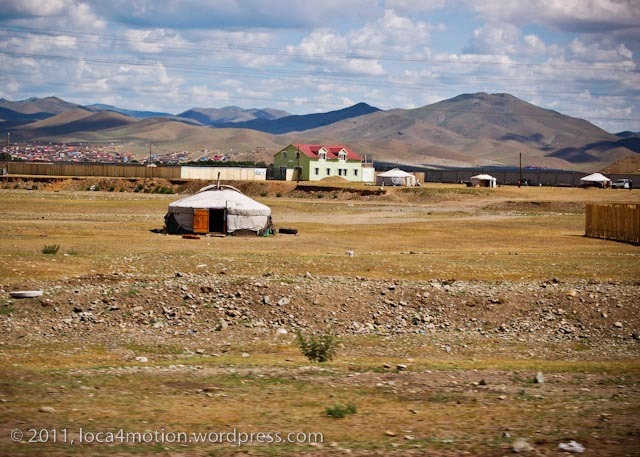 I’ll be posting more on Mongolia so you’ll see what it’s like, especially out on the steppe.